The solution is simple to create Shortcut to Restart Windows 8.1 / 10! press Ctrl+Alt+Delete, tap or click the Power icon Power icon, and then click Restart. ... create a Windows 8 or 8.1 desktop shortcut for fast shutdown, log off, restart! ... the Windows-8 the 'Shut Down Windows' Dialog Box! ... clear virtual memory pagefile at Windows 8.1 Shutdown! ... Auto Shutdown the Windows-8 and 8.1! ... Shutdown, Log-Off, Restart in windows 8.1 tray area! 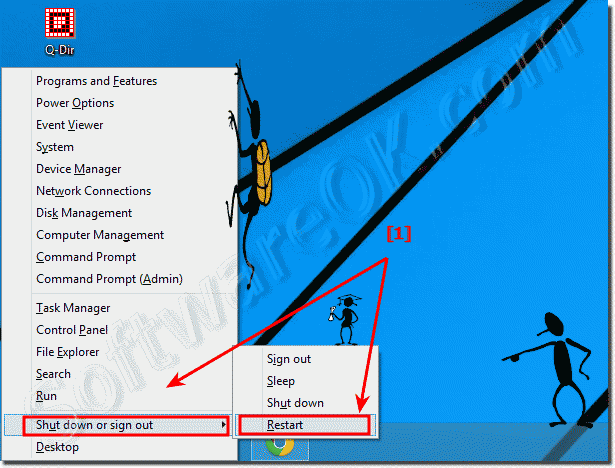 (Image-1) Keyboard Shortcut to Restart Windows 8.1! The Windows 8.1 and Windows RT 8.1 use power efficiently, so you won't need to shut down your PC unless you're going on vacation or will be away from your PC for a while. However, you’ll occasionally have to restart your PC after you’ve installed a new app or to finish installing updates. Here's how to do it. Windows-8 - FAQ-175: Shortcut to Restart Windows 8.1 / 10! Create shutdown shortcut windows 8.1? Window 8.1 restart short cut key? Where is the Restart Button in Windows 8.1!? Windows 8.1 shutdown shortcut key? Restart efi windows 8 key shortcut? Keyboard shortcut to restart ? Shortcut for restarting windows 8.1? Windows 8.1 shortcut to power restart icon? Shortcut remover para windows 8.1? What is restart on windows 8? Windows keyboard shortcut restart windows 8.1? Windows 8.1 shutdown keyboard shortcut? Restart driver in windows 8.1? How to restart my Windows-8.1? Windows 8.1 keyboard shortcut shutdown? Can I Restart my Windows 8.1.? Windows 8.1 shortcut to restart? Windows 8.1 shutdown shorcut key? Windows 8.1 shut down icon? Shut Down Windows 8.1 With A Keyboard Shortcut? Fast restart of Windows 8.1!? Shutdown shortcut for windows 8.1?